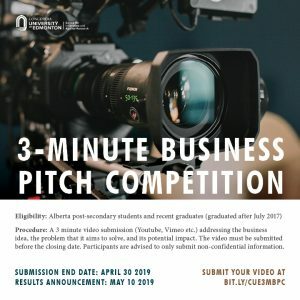 CUE’s Centre for Innovation and Applied Research (CIAR) announced its first 3-Minute Business Pitch Competition in March. Eligible videos can be seen on our YouTube channel. Go ahead and vote now for your favourite idea. The competition follows the spirit of 3 Minute Thesis (3MT) ® competition style that originated at The University of Queensland. This competition is an opportunity for students to showcase their innovative business ideas to a wider audience in the Edmonton region and beyond. Procedure: A video submission (Youtube, Vimeo etc.) addressing the business idea, the problem that it aims to solve, and its potential impact. The video must be submitted before the closing date. The video should not exceed 3 minutes in length. Participants are advised to only submit non-confidential information. Go-to-market strategy: The plan of how to reach the target market and how to achieve a competitive advantage. The judging panel for the competition will be composed of the Manager, CIAR, the Dean of the Faculty of Management and two industry delegates.